Like many HAE patients with no known family history, Ruby suffered tremendously before her diagnosis, with swells and stomach problems from being a toddler. By the time she was 5, she was spending more and more time off school due to sickness and the visits to GP and hospital began. Luckily for Ruby, we had heard of HAE as, ironically, her classmate suffers from the disease. The similarities between Ruby’s symptoms and her friends were very similar and this was how we finally got the correct diagnosis, not too long after Ruby’s 6th birthday. 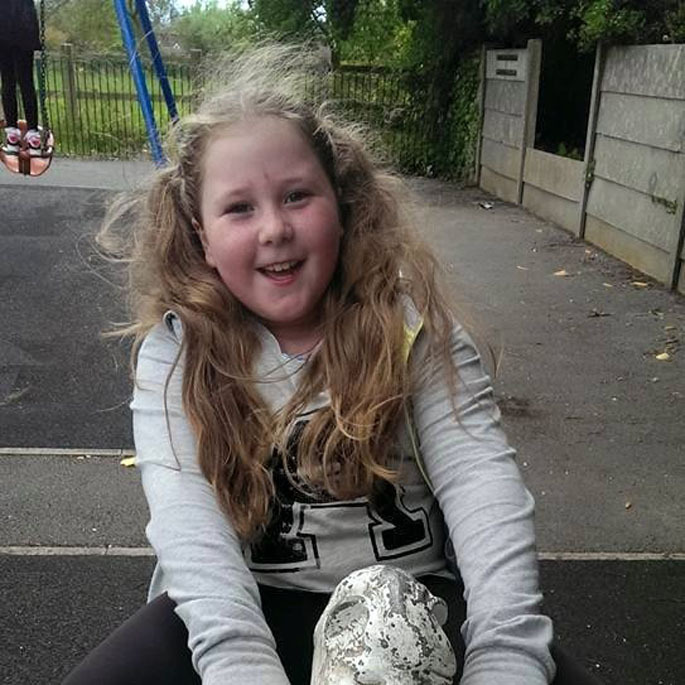 Ruby is very severely affected by HAE, experiencing swells every few days without treatment. Due to the frequency and severity of Ruby’s swells, her consultant decided that she would benefit from home therapy, just 2 months after her diagnosis. I was trained how to infuse her with 500u C1 Inhibitor, twice per week. This initially worked, however, after a year on this treatment she started to have more breakthrough swells so the dosage was doubled. Again, this worked for a while but recently, Ruby had to have the dose increased to 1000u 3 times per week. Ruby’s diagnosis of HAE has also led to my own diagnosis of the illness in November 2014, aged 45! I too had many ‘mystery’ illnesses during my childhood. Ruby has a fantastic outlook on life. Although she is shy by nature, she is happy, loving, very caring and loves to win! She is a football fanatic and an avid Manchester United Football fan. Despite mine and her dad’s concerns, Ruby was adamant that HAE would not stop her from participating in sport. She has recently won a certificate for swimming and has received numerous awards for football – most recently from Stockport County FC who have sent her a complimentary family ticket for receiving player of the season award during after school football coaching. Excitement is Ruby’s main trigger for HAE attacks, so we have to try and time her infusions to coincide with football matches, swimming day and any other events she is excited about such as birthday parties, sleepovers, trips out. Ruby also insisted on attending all of her school’s educational visits off site. The school was very concerned as to what they would do if Ruby had an HAE swell during an outside visit. To eliminate as much risk as possible and to ensure Ruby can attend all trips, I go with them and take C1 Inhibitor with me. 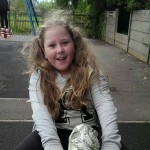 Ruby is excelling at school and has surpassed all targets set, apart from attendance. Unfortunately, due to HAE her attendance falls below the national average. Ruby does try to do everything that every other 9 year old child would do and when HAE knocks her down, she gets straight back up and gets on with living and enjoying life. Last week I was contacted by school who told me that her face was swelling at an alarming rate. They asked me to collect her immediately. I was able to collect her from school and infuse her within 40 minutes of the phone call. Ruby insisted on going straight back to school as soon as the swelling started to subside. Ruby is eager to learn how to administer her own C1. She already knows how to prepare the mix and has inserted the butterfly needle in my arm on several occasions. Although Ruby is very young, I feel that the knowledge alone that she could perform her own infusions would give her so much more freedom and peace of mind.